By Jose Gonzalez: Argentinian slugger Marcos Maidana (35-5, 31 KOs) reportedly plans on coming put of retirement to resume his stalled career. The 35-year-old former 2 division world champion Maidana will be signing with Al Haymon of Premier Boxing Champions, and his goal is to drop back down to 147 to fight in that weight class. Being signed with PPC will enable Maidana to fight the likes of Manny Pacquiao, Danny Garcia, Errol Spence Jr., Shawn Porter, Adrien ‘The Problem’ Broner and Keith ‘One Time’ Thurman. There’s a mountain of interesting fights available for Maidana, including a rematch against Broner. Maidana beat Broner by a 12 round decision in 2013 in an exciting fight. The boxing public would love to see a rematch between Maidana and Broner. There’s already talk of Maidana joining up with PBC, and facing Pacquiao in his next fight. It’s hard to believe that would be possible given how much weight the 5’8″ Maidana will need to take off to make the 147 lb welterweight limit. Moreover, the World Boxing Association would need to sanction the fight as a title fight. As the WBA champion, Pacquiao is supposed to be defending his title against contenders. Unless the WBA makes an exception for Maidana, it’s difficult to imagine the Pacquiao-Maidana fight being sanctioned as a world title fight. Seeing WBA Super World welterweight champion Keith ‘One Time’ Thurman struggle recently to defeat Josesito Lopez might have given Maidana food for thought. Maidana knocked out Lopez in six rounds in June 2013. That was a different version of Lopez that Maidana beat, but he still beat him and looked very good. This is the second time that Maidana has made noise about wanting to resume his career. He recently expressed interest about coming out of retirement to resume his career, but then he chose not to. Now months later, Maidana is now once again talking about wanting to continue his career. Only time will tell whether he’s serious about it. The biggest obstacle for Maidana making a successful comeback will be for him to take all the weight off. He’s looked heavy to say the least in the last few years, and he’ll need to trim the weight off for him to get back down to 147 if he’s serious about wanting to fight at his old weight class of welterweight. 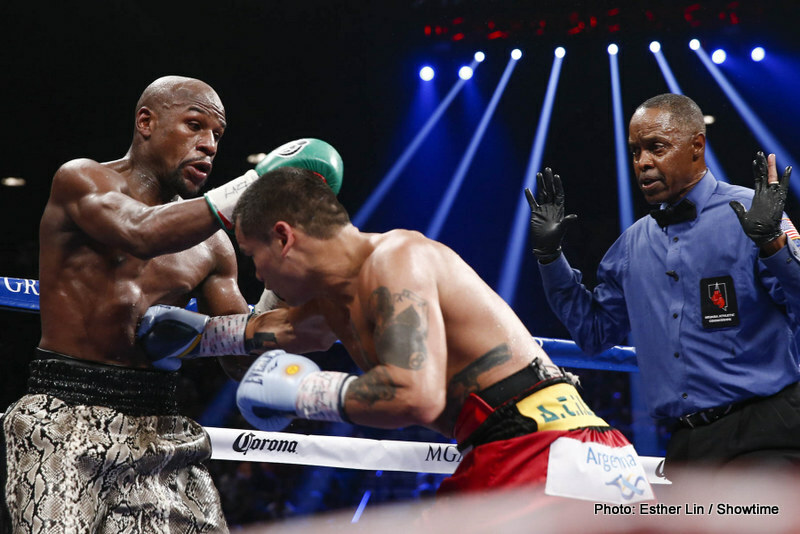 Maidana last fought against Floyd Mayweather Jr. almost five years ago on September 13, 2013 in Las Vegas, Nevada. Maidana lost a competitive 12 round unanimous decision by the scores 116-112, 116-111 and 115-112. Maidana shook Mayweather up with a hard right hand earlier in the fight that buckled his legs, but it came at the end of the round. 🇦🇷 Marcos Maidana has reiterated that he will return to the ring in 2019. He intends to link back up with Al Haymon’ PBC and get down to welterweight again. One question is what happened to Maidana’s money he made for his two fights against Mayweather? Does he still have it or has he blown it all? It would be a shame if Maidana is coming back to boxing for need of money rather than the love for the sport. Besides battling Mayweather in the distant past, Maidana has been involved in fights against the likes of Adrien Broner, Josesito Lopez, Jesus Soto Karass, Amir Khan, Erik Morales, Devon Alexander, Victor Ortiz, Andriy Kotelnik and Victor Cayo. As long as Maidana is able to resist enjoying rich foods and nice drink, he should be able to take all the weight off for him to get back down to the 147 lb weight class without any problems. Maidana ALWAYS blew up in weight between fights, and looked like he was close to 200 lbs, and he would take the weight off each time. This is no different The biggest question though is whether Maidana can set aside the life style that he’s become accustomsted long eough for him to take off all the weight. It’s difficult for a person to deny themselves a creature comfort that their body has become used to, such as plenty of food a the most expensive liquors. Maidana likes living well obviously, but can he go back to the spartan lifestyle that he would need to in order for him to lose all the weight? That’s the big question. Maidana wasn’t rich when he was fighting. He hit it big when he fought Mayweather in back to back fights in 2014. Maidana has tasted the good life now, and he might not be able to will himself through a long training camp to burn off the weight. There’s no way of knowing how much Maidana weighs right now, but it wouldn’t be surprising if he’s in the 220 range. Of that weight, Maidana would only need to lose 50 lbs to get down to approximately 170 lbs in order for him to fight at welterweight. Maidana could lose the rest by dehydrating for his fight, be it Pacquiao or whoever Premier Boxing Champions wants to put him in with.